I earned my first BA in Parks and Recreation Management with a concentration in Therapeutic Recreation in 1997 from UNCW. After working in the Human Services field for fifteen years providing for people who have special needs, the North Carolina health care reform discontinued the services we provided. I found myself in the position of needing to re-invent my career. I felt the best way to change career fields was to earn a new degree and I chose Communication Studies to help me accomplish my goals. Choosing where to earn this degree was never a question. My daughter has two BA’s from UNCW, and my son has a Communication Studies degree from UNCW. My husband is the only renegade in the family, with a degree from Campbell University, (which he earned before I met him). So as you can see, we are an UNCW family. I have really enjoyed taking Advertising 2 this semester. I would like to start by thanking the Advertising 2 group that I’ve had the privilege to work with and get to know. I’ve had the opportunity to work with a wonderful team and really appreciate the teamwork and support within this group. Working on my second BA as a non-traditional student has been a wonderful, and hectic experience. I have enjoyed being part of the Communication Studies department and appreciate the support and advice from everyone. Since I already have a BA degree, Ms. Bulger had to work extra hard helping me deal with a difficult class schedule, making sure I took the appropriate classes. There are many classes I would love to have the opportunity to take but am unable to due to time constraints. Ms. Bulger worked with me to make sure I was able to get as many within this year as possible. I would also like to thank Dr. Olsen and Ms. Becka for the support they offered to get me through summer classes while being very ill and ultimately having surgery. I would not have been able to complete Summer 2 classes without them. Last, but not least, I want to thank Dr. Persuit for giving me the opportunity to take Advertising 2. The skills I have learned in this class and IMC 1 are invaluable and something I will carry with me into my new career. I will be graduating July 2014 after completing a summer internship. I am excited and looking forward to having the opportunity to apply the skills I have learned while completing my internship. There are many emotions I feel, sadness over not being able to pick out classes next semester, but mostly excitement over starting a new career and life. 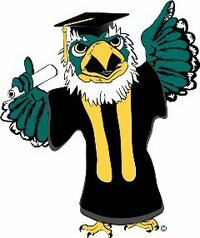 I will once again be graduating Seahawk proud.